The Neurocritic: What's Popular at #CNS2017? Word cloud for 835 poster titles at CNS 2017. The 2017 Cognitive Neuroscience Society annual meeting will start tomorrow, March 25. To no one's surprise, memory is the most popular topic in the bottom-up abstract submission sweepstakes. 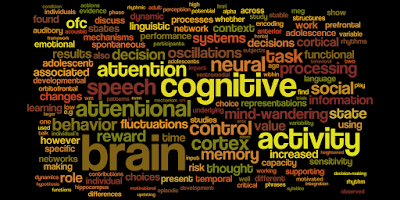 In contrast, the top-down selections of the Cognosenti are light on memory, with a greater emphasis on attention, speech, mind-wandering, and reward. 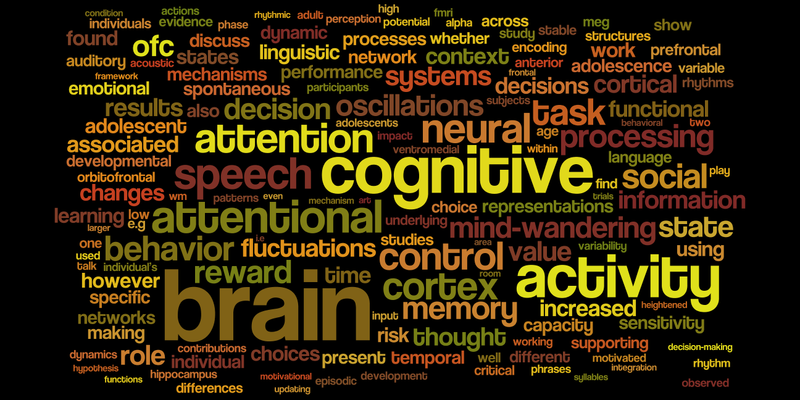 Word cloud for 16 titles/abstracts in four Invited Symposia. The member-generated Symposium Sessions are once again memory-centric, but with the key additions of speech, learning, information, and oscillations. Word cloud for 43 titles/abstracts in nine Uninvited Symposia. The hot area of the brain this year is OFC, the orbitofrontal cortex. Six speakers, in three pairs, will consider some major challenges and cutting-edge advances, from molecular mechanisms to decoding approaches to network computations. The presentations and debate aim to provide a tentative outline of what might be a productive and ambitious agenda for our fields. The biggest topic should be "how do we prevent false findings from seeing the light of press". Until that happens, cognitive neuroscience (and too many other fields) will continue producing garbage.